Graduate student Hoyt Peckham examines a dead sea turtle found during a survey in Baja California. Along the southern coast of Baja California, Mexico, scientists have been counting the carcasses of endangered sea turtles for a decade as part of an effort to assess and eliminate threats to loggerhead sea turtle populations. Their findings, published this week, are shocking: almost 3,000 sea turtles were found dead along a 27-mile stretch of coast during a five-year period from 2003 to 2007. Led by Hoyt Peckham, a graduate student at the University of California, Santa Cruz, the study underscores the enormous impact of bycatch (marine life accidentally killed by fishing operations) on sea turtles. 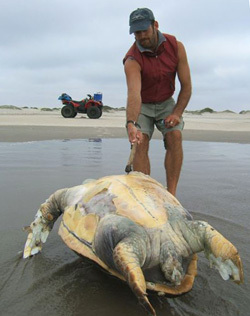 Bycatch and, to a lesser degree, poaching are both significant threats to the survival of the endangered Pacific loggerhead sea turtle population, Peckham said. "We saw what are apparently the highest documented stranding and fisheries bycatch rates in the world," he said. "But the high bycatch rates offer us all an unexpected conservation opportunity. By working with just a handful of fishermen to diminish their bycatch, we can save hundreds of turtles." Peckham and his coauthors, whose findings appear in a special bycatch issue of Endangered Species Research, are working to increase awareness of the problems facing sea turtles in Baja California Sur. They hope this report will encourage Mexico's government agencies to finalize creation of a refuge that protects turtles and encourages sustainable fishing in the area. "We have counted so many dead turtles. We have piles of data on thousands of carcasses. What we need now are conservation actions and viable solutions," said Wallace J. Nichols, research associate with the California Academy of Sciences and a coauthor of the paper. The authors partnered with local fishermen not only to assess bycatch but also to increase awareness of its far-reaching effects and work toward ending the threat. "Once they are aware of the ocean-wide impacts of their local bycatch, fishermen often strive to fish more cleanly by switching to different techniques, target species, or areas," Peckham said. "As a result, stranding rates were down in 2008." In addition, local fishermen are working with the Mexican government to designate a sea turtle refuge that would officially protect an area the researchers identified as a "hotspot" of turtle bycatch. Conservation tourism offers another potential solution to these problems by giving fishermen an alternative to dwindling, inefficient fisheries, Peckham said. Through training and a steady tourism market, many fishermen and former poachers have come to value sea turtles more highly alive than dead, because conducting tours can yield more income than fishing, he added. One organization that has promoted ecotourism in this area is the Ocean Conservancy through its SEE Turtles program. The program links travelers with critical sea turtle conservation sites so that vacation dollars can both protect the sea turtles and enhance the livelihood of community residents who protect them. North Pacific loggerhead sea turtles travel more than 7,000 miles from Japan to Baja California Sur to feed and grow in nearshore waters, spending up to 30 years there before returning to Japan to breed. The number of nesting females in Japan has declined by 50 to 80 percent over the past 10 years, Peckham said. In addition to Peckham and Nichols, the authors of the new study include Tim Tinker, adjunct professor of ecology and evolutionary biology at UCSC; David Maldonado Diaz and Alexander Gaos of Grupo Tortuguero, a nonprofit conservation group based in La Paz; and Volker Koch and Agnese Mancini of the Autonomous University of Baja California Sur. Note to reporters: You may contact Peckham at hoyt@biology.ucsc.edu.